100% Whole Food Nutrition – Powered by Enzymes! 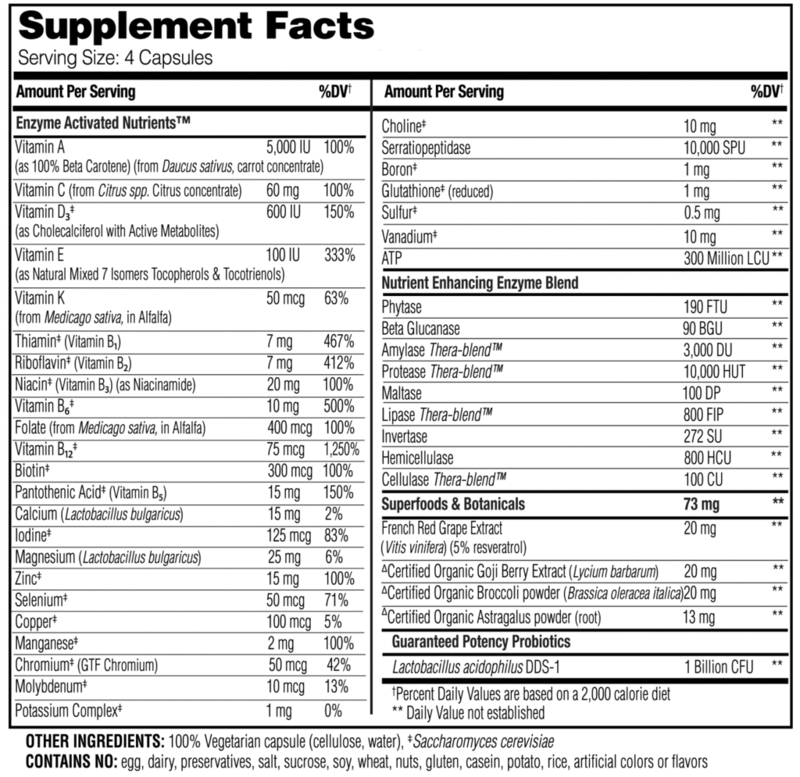 Enzyme Nutrition for Men contains Enzyme Activated Nutrients™ (EAN) as part of a whole food matrix. It is personalized to meet the unique needs of modern men. Enzyme Activated Nutrients Enzymedica believes the greatest science comes from observing nature. Nature never provides vitamins and minerals in a single isolated molecule. Furthermore, no single isolated vitamin or mineral in any nutrient matrix is solely responsible for a nutritional benefit; it must be attached to cofactors and enzymes to be utilized by the cells of the body. Vitamins and minerals (nutrients) that are part of a complex grouping of naturally occurring compounds in whole foods are best described as nutriments. This complex matrix includes enzymes, coenzymes, cofactors and phytonutrients, along with amino acids, lipids and carbohydrates. The greater the density of vitamins or minerals bound in such a matrix, the greater nutritional value of the food and the more benefit the body will derive. Enzyme Activated Nutrients are grown to preserve the highest enzyme potency from within the food structure. These enzymes along with naturally occurring cofactors ensure that the body recognizes and utilizes the nutrients as whole food, thus increasing potency. Enzymedica has also added Thera-blend™, a unique enzyme blend, specifically formulated to enhance the value of the vitamins and minerals in the body. This combination makes them easily digestible and absorbable while improving utilization. Naturally occurring ATP complements a healthy diet by increasing the energy potential of the foods consumed. Take two capsules twice a day for best results. If preferred, four capsules can be taken anytime during the day, even on an empty stomach. Nutrient Dense and Energy Efficient Recent research suggests that the key to living longer is to efficiently manage the “energy allocation” of the body.1 This is done by consuming “nutrient dense” foods, while eliminating the intake of anything that requires an undue amount of energy to digest and convert vitamins and minerals to nutriments (e.g., cooked and processed foods or isolated vitamins and minerals). Enzymedica’s Enzyme Nutrition Multivitamins provide nutrition in a manner that requires the least amount of energy to benefit the body. Because they are part of the complex matrix of whole foods, they include enzyme attachments, which support efficient delivery. As the leader in enzymes, Enzymedica’s Enzyme Nutrition provides high potency enzymes and probiotics along with compound-rich botanicals in combination with nutrient dense whole foods creating what we believe to be the “best multivitamins on the planet.” •100% Whole Food •Enzyme Activated Nutrients (EAN) •Powered by a superior enzyme blend (Thera-blend™) •Guaranteed potency, shelf stable probiotics (1 billion CFU per dose) •Nutrient-Rich Superfoods & Daily Botanicals •Increase Energy* – B Vitamins, Astragalus •Bone Health* – Calcium, Magnesium, Vitamin D, Vitamin K, Boron •Hair, Skin & Nails* – Vitamins A (as Beta Carotene), C and E •Breast & Hormone Health* - Broccoli seed extract, Folic acid, Magnesium, Vitamin B6, Vitamin E, Vitamin D.